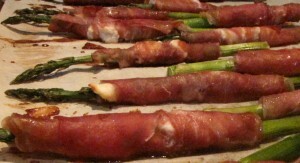 If you’re looking for an appetizer that’s easy to make and looks very fancy, give this prosciutto wrapped asparagus with goat cheese a try. This is one of my favorite appetizers because you can eat them with your fingers (no fork required! ), they can be made ahead of time and they taste great right out of the oven or at room temperature. I mean, what’s not to like? Salty prosciutto, tangy goat cheese and asparagus. All good stuff. Three simple ingredients create a fabulous appetizer. 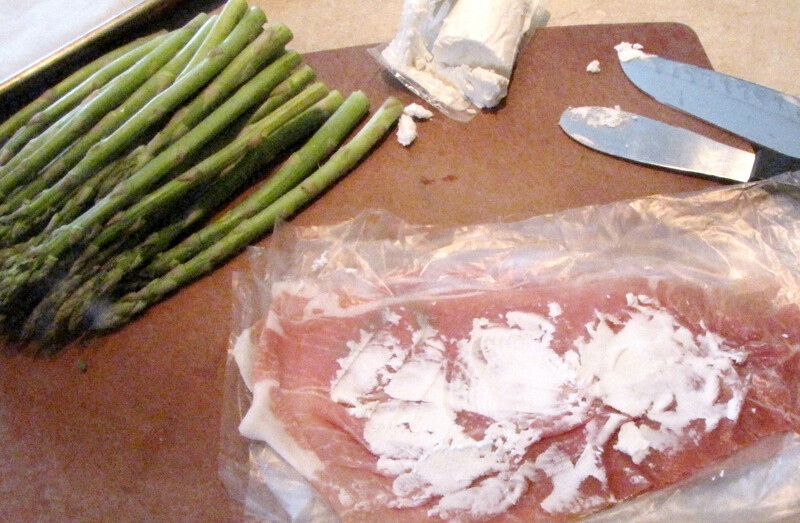 All you need to do is spread a little goat cheese on the prosciutto. I’ve found that the goat cheese spreads better if it’s at room temperature. You can use your microwave, in 10-second increments, to warm it up a little. If you have an icing spreader, use it. The back of a spoon works well too. 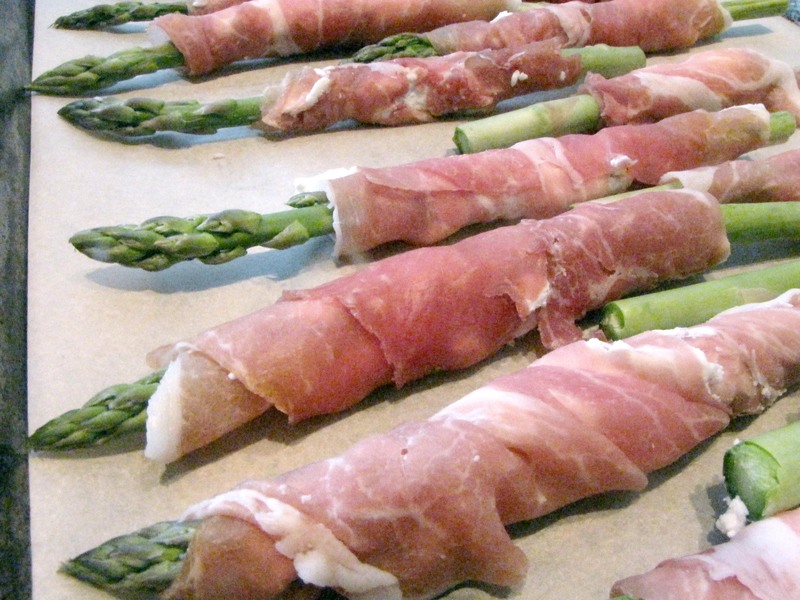 Cut the prosciutto in half lengthwise and wrap around the asparagus. I like using a parchment paper-lined baking sheet for these. Bake at 400F for 20 minutes then turn and bake for another 10 minutes for a total of 30 minutes. 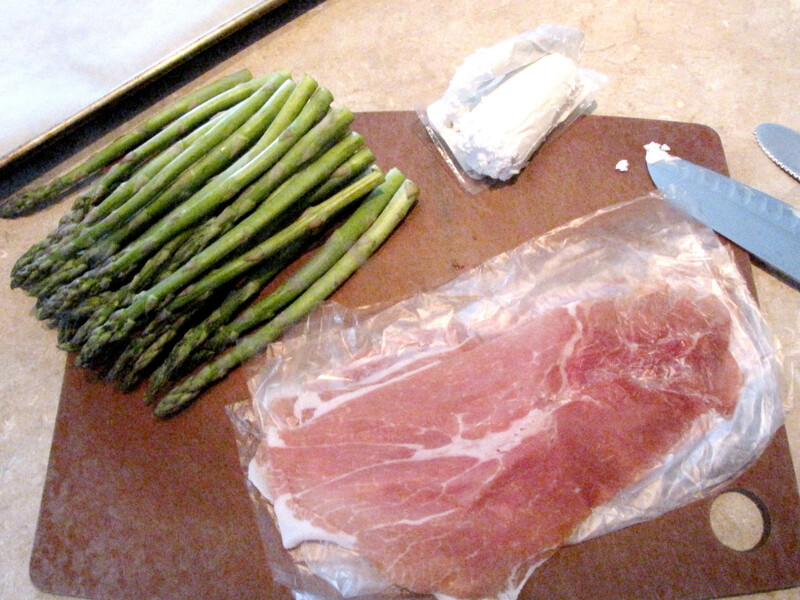 When it’s done, the asparagus will be tender and the prosciutto slightly brown and a little crisp. Serve warm or at room temperature. Serve whole or cut in half if you’re serving a crowd. And there you have it – my gift to you – you’re welcome. Oh, yumyumyumYUM!! I adore asparagus wrapped in prosciutto, but have never had it with goat cheese – swoon! Cheers to a fabulous 2014!